This artist's concept shows an overhead view of the orbital position of the planets in systems with multiple transiting planets discovered by NASA's Kepler mission, and announced on Jan. 26, 2012. 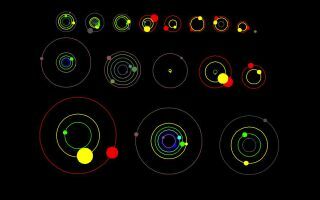 All the colored planets have been verified. The planet candidates shown in grey have not yet been verified. In this space wallpaper, NASA's prolific planet-hunting spacecraft has hit the jackpot again, discovering 11 new planetary systems with 26 confirmed alien planets among them. The findings nearly double the number of bona fide planets found outside our solar system by the Kepler space observatory.